The Golden K: A romantic perspective of life at 3100 feet. I hope it never gets old. 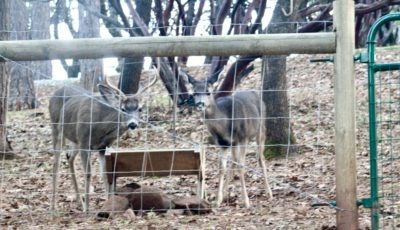 I hope I always appreciate the circle of life and seeing the young black tail deer make their first visit to The Golden K. The male yearlings, the young does, and the fawns. I was surprised to see it today because it is a little early in the year. 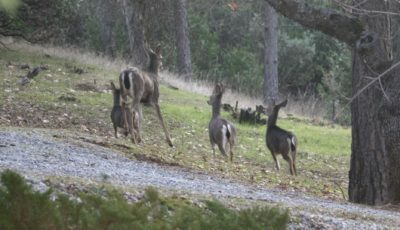 The deer seem so regulated by instinct and seasons so I was surprised that well in advance of Spring the deer appeared in large numbers today. 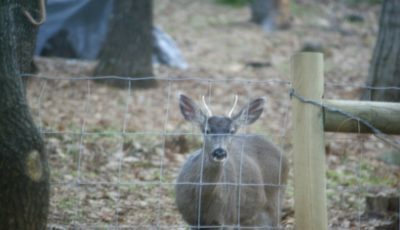 One of our regular mature bucks, Linus, came down to forage around our patio this afternoon as he usually does. He is always solo, although during the summer and early fall he was regularly accompanied by another larger buck we call Charlie Brown. Today was no different. Linus showed up around 4:30, foraged, and went on his way after about 20 minutes. This has been his winter routine. I haven’t seen Charlie Brown in several weeks and I’ve been worrying that something bad had happened to him. Charlie Brown: Charlie Brown and I connected during the summer. We shared long stares from no more than 15 feet looking into each other’s eyes. He rarely became skittish when I moved in to get a closer look at him in his natural glory, his coat of beautiful brown and white fur, and sturdy antlers. I have great respect for the creatures that grace the Golden K and am always mindful that they are wild, as tame as they may seem at times. 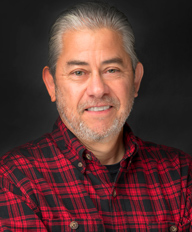 But I also have a great desire to connect with all aspects of the Golden K at a personal level. To be able to share a few moments in close proximity with the wildlife adds to my romantic perspective of life at 3100 feet. Charlie Brown generously afforded me that privilege during the summer. We connected. So I’ve been worried that he may have succumbed to illness or a hunters gun. 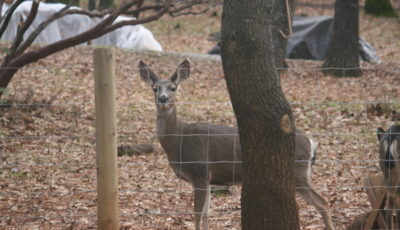 But a few days ago as I opened the kitchen doors to let the dogs out I was unaware that a deer was nearby. Out of the corner of my eye as the deer ran away upon seeing the dogs it appeared to be Charlie Brown. I’m not sure but I’m hopeful. 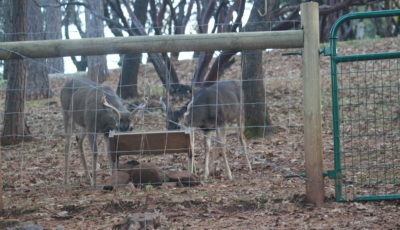 Shortly after Linus left this afternoon several yearlings, does and fawns came down together. It seems a little early for the official return of the black tail deer to the Golden K but maybe the warm and dry weather has accelerated their interest and confidence to come out of hiding during the day to forage near humans. I really don’t know the reason for the early appearance but it brought me great happiness today to see the newbies. The young bucks with their itty bitty antlers not yet shed. 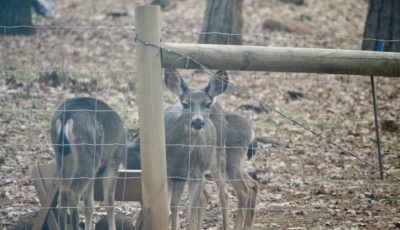 The does who are usually shooed away during Summer by the older bucks. And especially the fawns, spots still evident, and probably still nursing. I pray they will all continue to grace the Golden K through Spring and Summer. And I hope to see Charlie Brown again soon. We meet isolated white tail deer on trails, but our “local” visitors tend to be urban foxes and coyotes, plus the smaller raccoons. We gets lots of variety with birds such as Blue Jays, Cardinals, Robins, Chickadees, Baltimore orioles (love them)…. and a local hawk (not too sure of variety) oversees things! Regardless of the visitors though, it is just so rewarding to put life’s brakes on and just watch isn’t it. Great Post Mike. Thanks Colin. We’re only spectators and I’m grateful to be such. It really is pretty special and we feel fortunate to live in the middle of the forest with all these furry beasts. And to top it all off and make me so happy this morning Charlie Brown accompanied Linus and a young buck down for breakfast. As he approached we held a long knowing stare. It was a great way to start the day!